With all the national competitions wrapped up, the silly season is once again approaching and with Borussia Dortmund about to announce Lucien Favre the German club, in particular, is the centre of transfer rumours. One such rumour is that Favre could arrive in Dortmund bringing along striker Alassane Pléa. A product of the Olympique Lyonnais academy Alassane Pléa would be the latest forward from Lyon to arrive at a top European club. In many ways, it would be a path all to well travelled. Since the turn of the century, Olympique Lyonnais have been successful on the pitch, winning the Ligue 1 seven times in a row between 2002 and 2008 which is a national level record but also on the outside of it. After a decade of dominance over french football in which they managed to retain their best players regardless of interest from other leagues. After their first season without a title, Lyon sold Benzema to Real Madrid in July 2009. Unfortunately for them, the investment made from the transfer fee did not help them to come back to their usual spot. The lack of success and the investment in their new stadium Groupama Parc OL in 2012 meant that they had less money to invest in the renewal of their squad in order to achieve its president goals, the league title and compete in the Champions League. Adapting to the reality of the French League that cannot compete financially with its neighbouring countries, Lyon also focused its efforts on their academy. Many french stars of this decade – such as Karim Benzema, Samuel Umtiti, Alexandre Lacazette, or Nabil Fekir, a player that the Futbolgrad Network scouted earlier this season, have all been through the ranks of l’OL. Another player that went through the ranks of l’OL Academy is Alassane Pléa, who like Loïc Remy or Jeremy Pied before him, left Lyon to play their trade for OGC Nice. 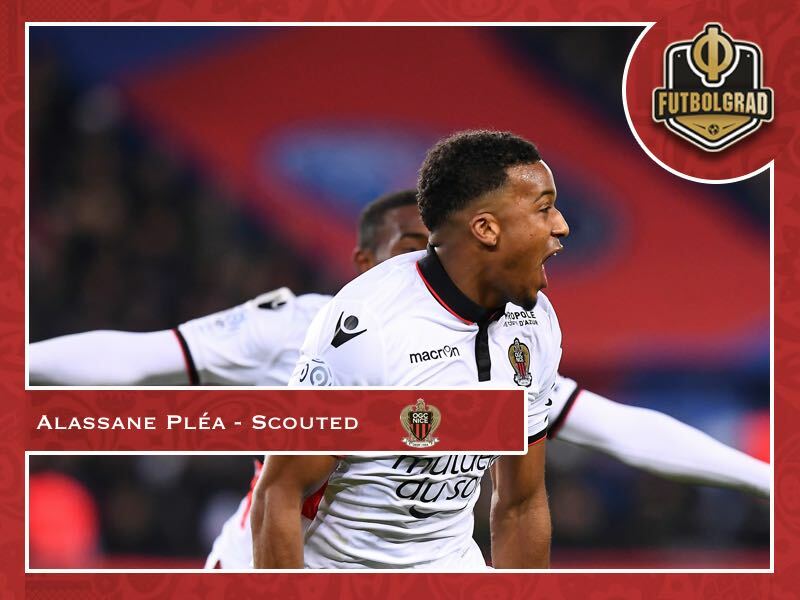 Pléa has been playing for Nice since 2014 but it is since the arrival of Lucien Favre as the head coach of Nice in 2016 that he has gained in importance in the squad. His partnership with Mario Balotelli, who also arrived in Nice at the same time as Favre has been lethal. 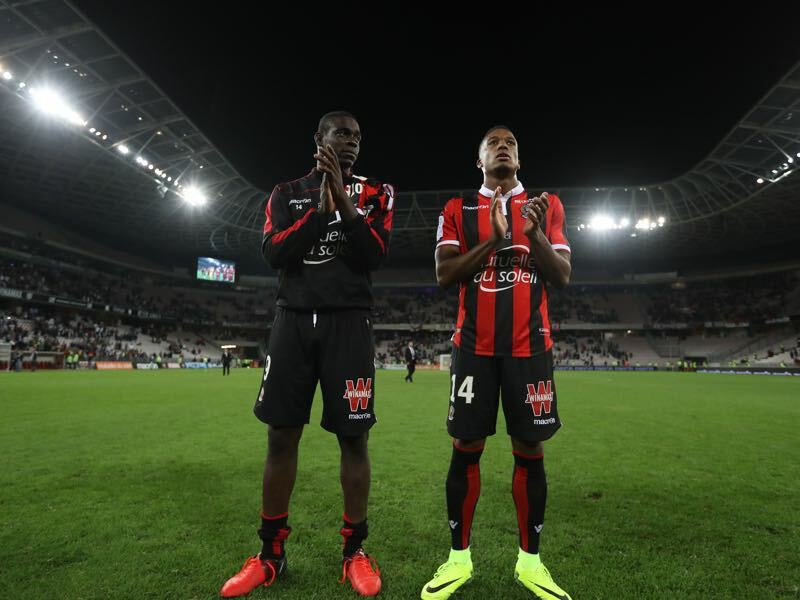 In their first season together, Pléa and Balotelli contributed to OGC Nice qualification to the Champions League qualifiers by scoring a total of 26 of Nice’s 63 goals in the French Ligue 1. An argument could even be made that Pléa was the critical piece, alongside head coach Favre, in resurrecting Balotelli’s career in France. A quiet character Pléa allowed Balotelli to take centre-stage in Nice giving Balotelli the room the eccentric striker needed, but at the same time backing him up on the pitch. That in itself demonstrates a sort of leadership quality, a character trade that accentuates teammates rather than personal prowess. Hence, even when Nice struggled in the 2017/18 season, they still managed to improve their stats – with Plea scoring 16 and Balotelli scoring 18 goals for OGC Nice throughout the season. Lucien Favre departure from OGC Nice and his possible signature for German giants Borussia Dortmund on a two-year deal make both players ideal transfers targets for BVB. While both players have been linked to Dortmund, Balotelli’s potential signature for Marseille opens the path for Pléa to sign for BVB. According to l’Equipe and other French newspapers such as Nice Matin, Pléa is interested in following Favre even though other clubs such Sevilla and Borussia Mönchengladbach are interested – Gladbach have even prepared a €20 million offer to OGC Nice last week for the player. What sort of player would any potential club get? Pléa is not only a fantastic pacey striker, who scores goals every weekend, he is also a philanthropist. Inspired by Juan Mata and his project Common Goal, that aims to donate 1% of football players salaries to charities from across the world, Plea pledged to donate his salary to his club’s charity. According to Le Monde estimates, Pléa will donate €14,000 year to the endowment fund of OGC Nice, initiated in March 2018 to carry out grassroots actions at the local level. Pléa would, therefore, not just be a striker capable of scoring on the field and make his teammates better, he is also a player that looks beyond the pitch. Given some of the issues, Dortmund have face last season Pléa could be the sort of personality Dortmund require to regain their former strength.